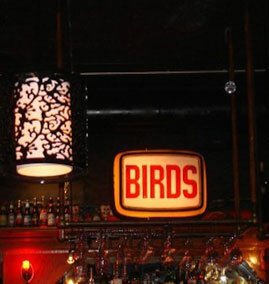 You'll find birds Restaurant in the heart of LA's most historic district, nestling below the Hollywood sign. We've been a Los Angeles landmark since 1994, serving great food in a unique atmosphere, immortalized in fiction (Michael Connelly's 2006 bestseller Echo Park) and namechecked in all major local guidebooks. Franklin Village, designated as an official neighborhood by the city of LA, is an oasis amidst the otherwise urban sprawl of tourist shops and strip malls of Hollywood. It's an artist's community where everybody literally knows your name. Positioned between Beachwood and Bronson Canyons, people actually walk in this neighborhood! Strolling to and from their hillside dwellings, whether shopping or hiking the hills with their dogs, they get to know one another. We call it "Mayberry" with a side of 'hip'. Hang out on a sunny afternoon(that's every day! )on our outdoor patio and people-watch. Bring your pooch. We serve doggie chicken for just $2 and we love our canine customers. Check out a comedy show at Upright Citizen's Brigade next door, pick up a used book or vinyl record at Counterpoint Books, grab a unique gift at The Daily Planet Newsstand and Boutique. In other words, spend a day or evening here on the block. It's a destination spot. But please don't tell everyone, it's our secret neighborhood! Copyright © 2016 Birdshollywood. All rights reserved.